Shares of the personalized styling service unraveled after a disappointing earnings report. Shares of Stitch Fix, Inc. (NASDAQ:SFIX) plummeted last month after the personalized styling service posted disappointing customer growth in its fourth-quarter report. The company's stock had surged in the months before that report, but gave up essentially all those gains in the wake of those results as investors feared the service could be more of a fad rather than a long-term trend. 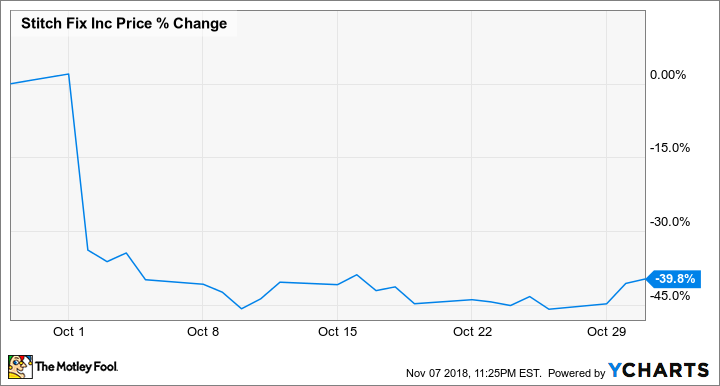 According to data from S&P Global Market Intelligence, the stock fell 40% last month, and as the chart below shows, virtually all of those losses came immediately following the Oct. 1 earnings report. In some aspects, Stitch Fix's report was actually pretty good. Revenue increased 23% to $318.3 million, which just missed estimates of $318.9 million. However, profitability improved significantly in the quarter. Gross margin ticked up 90 basis points to 44.4% due to better inventory management, and selling, general, and administrative expenses fell 150 basis points to 41.9%, due in part to systems improvements in its warehouses. As a result, adjusted earnings per share surged to $0.17 with the help of a tax benefit, much better than the $0.18-per-share loss a year ago. That result easily beat estimates for earnings of $0.04 per share. Without the tax benefit, Stitch Fix's adjusted EPS would have been about $0.06. What really seemed to provoke the sell-off was active user growth, which was up 25% to 2.74 million year over year, but sequentially only rose by 2%, sparking fears that customer growth was rapidly slowing. The fourth quarter is a seasonally slow one, and CEO Katrina Lake sought to focus on year-over-year growth. However, investors' concerns are likely to persist until the company demonstrates stronger active user growth. Stitch Fix also issued guidance for the fiscal year that may have been more modest than some had hoped for. The company sees revenue increasing 20%-25% to $1.47 billion-$1.53 billion, marking a slowdown from 26% last year. On the bottom line, it expects adjusted EBITDA of $20 million-$40 million. Stitch Fix's slide was in large part a correction from earlier gains, and the company still looks poised for further growth, especially with its recent launch of a Kids segment, and its planned expansion to the U.K. next year. However, investors will want to keep their eye on active user growth over the coming quarters.